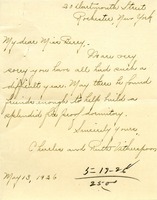 Charles and Ruth Witherspoon send Martha Berry 25.00 and wish her good luck building a new fire proof dormitory. 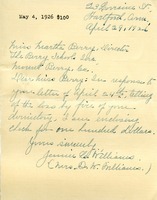 Miss Berry asks for a donation for their fire-proof dormitory. Martha Berry asks for donations because of the recent dormitory fire. Miss Berry thanks Mr. Howe for his donation to the new dorm building. Wm. P. Wharton sends a donation of $500 to help pay for the dormitory at the Foundation School that was lost in a fire. 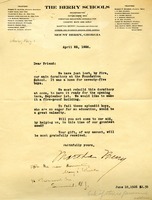 Mary Wheeler sends Martha Berry $2.50 to help pay for the loss of the main dormitory at the Foundation school. 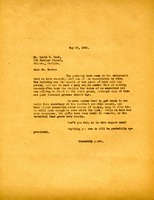 This letter from Martha Berry describes the loss of the dormitory at the Foundation Schools. She is requesting money to help rebuild and fireproof the replacement building so that they can have it ready for the opening term that September. 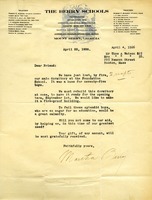 The letter also seems to carry Wilcox's handwritten reply, indicating that he would love to help out. A letter from Martha Berry which explains the schools' need for donations as the main dormitory at the Foundation School had just burned down. 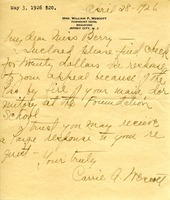 Ansley Wilcox writes Martha Berry to inform her that he will be donating $200.00 to the Berry Schools. He also sends his regrets about the fire at the school. Mrs. Williams encloses a check for $100 in response to Miss Berry's letter about the fire and lost dormitory. 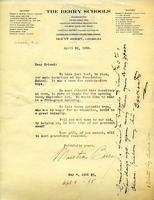 Carrie A Wescott sends a donation to help with the rebuilding of the dormitory that burned down.